Introduction Impact Through Teaching Dr Liz Andrew Life Sciences Dr Claire Stocks Humanities. 2 Brainstorming What does it mean to be a teaching fellow? 1.What does the teaching entail? 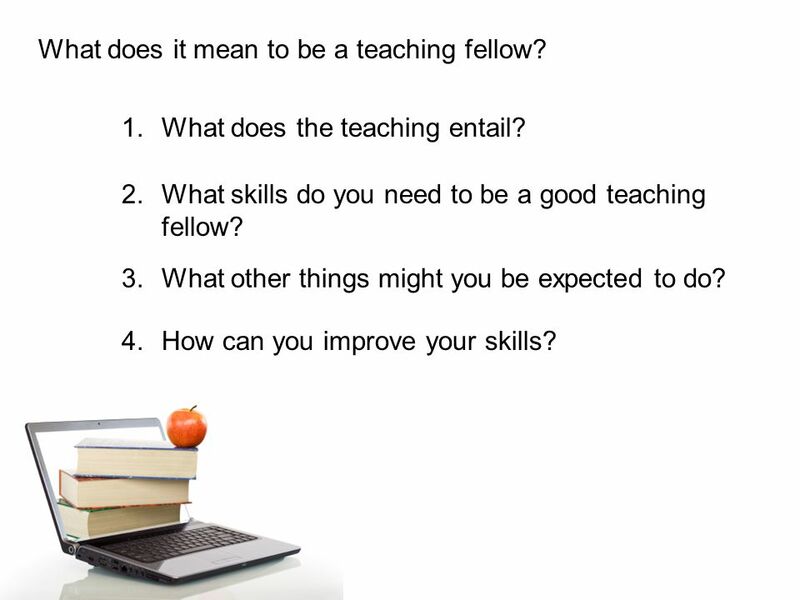 2.What skills do you need to be a good teaching fellow? 3.What other things might you be expected to do? 4.How can you improve your skills? 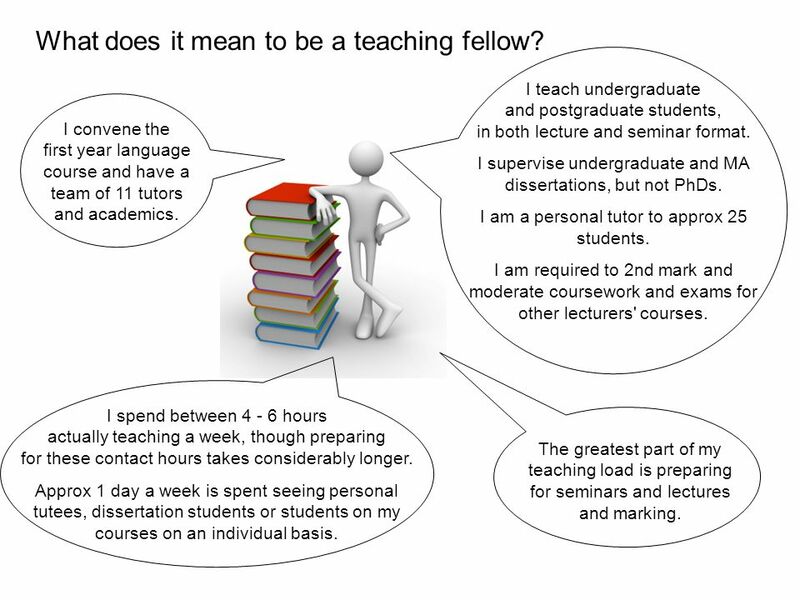 3 TF comments 1 What does it mean to be a teaching fellow? I teach undergraduate and postgraduate students, in both lecture and seminar format. I supervise undergraduate and MA dissertations, but not PhDs. I am a personal tutor to approx 25 students. I am required to 2nd mark and moderate coursework and exams for other lecturers' courses. The greatest part of my teaching load is preparing for seminars and lectures and marking. I spend between 4 - 6 hours actually teaching a week, though preparing for these contact hours takes considerably longer. Approx 1 day a week is spent seeing personal tutees, dissertation students or students on my courses on an individual basis. I convene the first year language course and have a team of 11 tutors and academics. 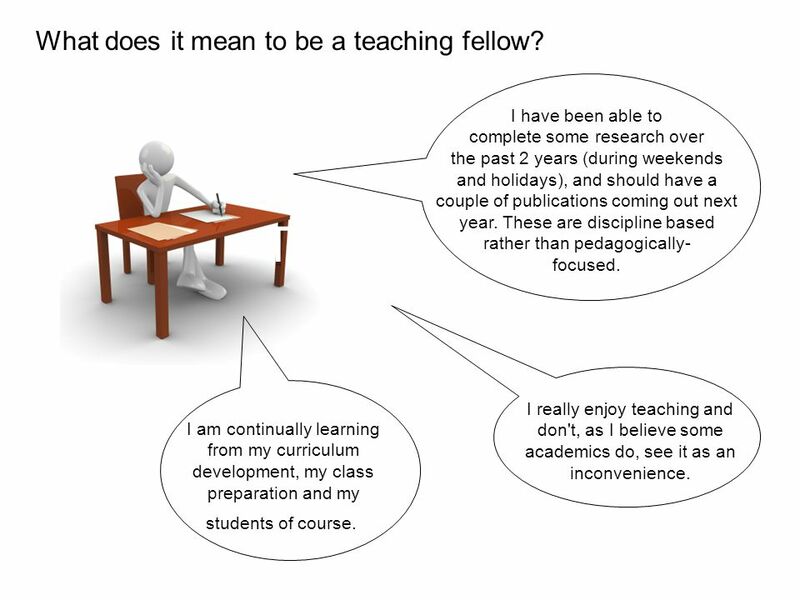 4 TF comments 2 What does it mean to be a teaching fellow? I really enjoy teaching and don't, as I believe some academics do, see it as an inconvenience. I am continually learning from my curriculum development, my class preparation and my students of course. I have been able to complete some research over the past 2 years (during weekends and holidays), and should have a couple of publications coming out next year. These are discipline based rather than pedagogically- focused. 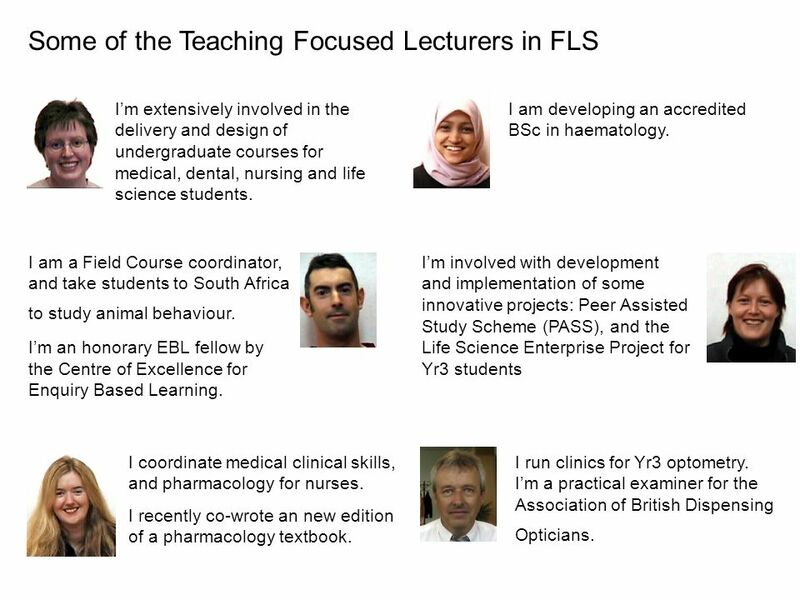 5 FLS TFs Some of the Teaching Focused Lecturers in FLS I’m involved with development and implementation of some innovative projects: Peer Assisted Study Scheme (PASS), and the Life Science Enterprise Project for Yr3 students I coordinate medical clinical skills, and pharmacology for nurses. I recently co-wrote an new edition of a pharmacology textbook. I am developing an accredited BSc in haematology. I’m extensively involved in the delivery and design of undergraduate courses for medical, dental, nursing and life science students. I am a Field Course coordinator, and take students to South Africa to study animal behaviour. I’m an honorary EBL fellow by the Centre of Excellence for Enquiry Based Learning. I run clinics for Yr3 optometry. I’m a practical examiner for the Association of British Dispensing Opticians. 7 Teaching & Learning Support Teaching and Learning Support Appointments at this level may be required to: Design, develop and produce teaching and learning material and deliver either across a range of modules or within a subject area. Use appropriate teaching, learning support and assessment methods. Supervise student projects and the academic elements of field trips and, where appropriate, placements. Identify areas where current provision is in need of revision or improvement. Contribute to the planning, design and development of objectives and material. Select appropriate assessment instruments and criteria, assess the work and progress of students by reference to the criteria and provide constructive feedback to students. Set, mark and assess work and examinations and provide feedback to students. Ensure that module design and delivery comply with the quality standards and regulations of the university and School. 8 Scholarship, Communication Scholarship Appointments at this level may be required to: Engage in scholarship as required to support teaching activities. Extend, transform and apply knowledge acquired from scholarship to teaching and appropriate external activities. Make presentations at national and international conferences and similar events. 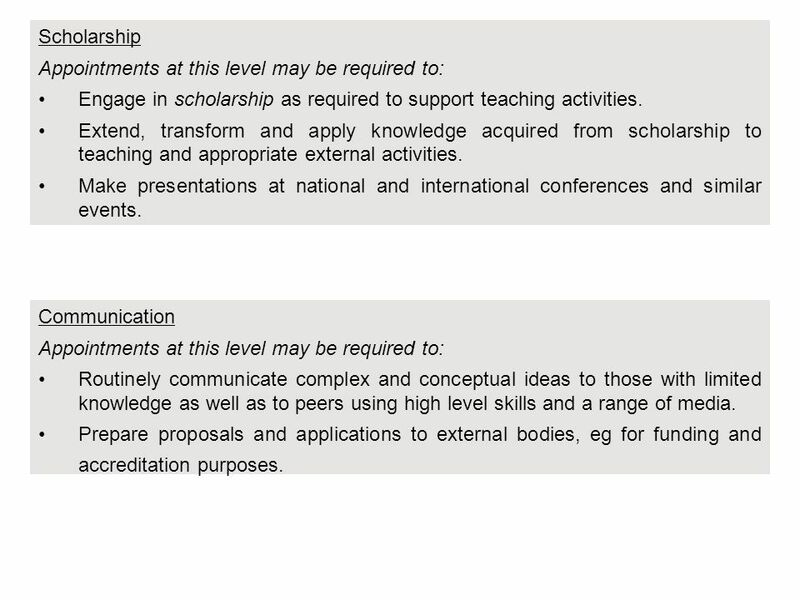 Communication Appointments at this level may be required to: Routinely communicate complex and conceptual ideas to those with limited knowledge as well as to peers using high level skills and a range of media. Prepare proposals and applications to external bodies, eg for funding and accreditation purposes. 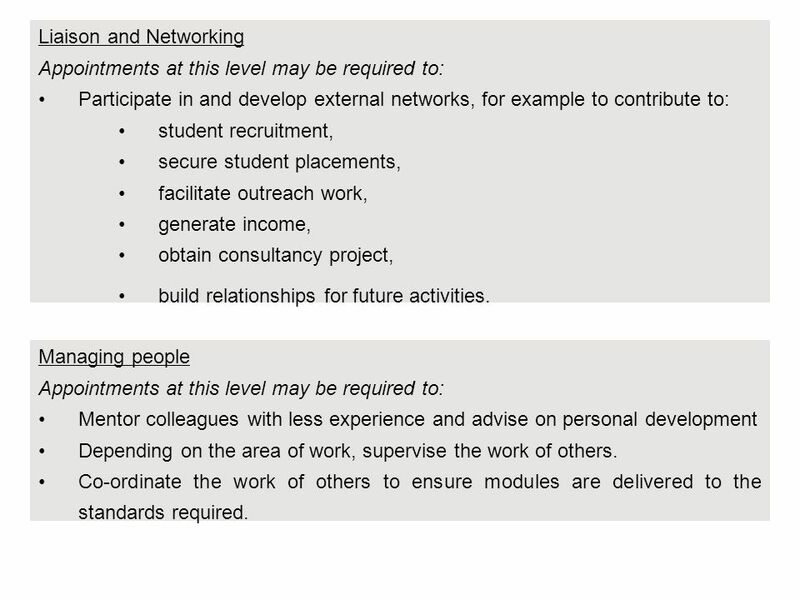 9 Networking, Managing People Liaison and Networking Appointments at this level may be required to: Participate in and develop external networks, for example to contribute to: student recruitment, secure student placements, facilitate outreach work, generate income, obtain consultancy project, build relationships for future activities. Managing people Appointments at this level may be required to: Mentor colleagues with less experience and advise on personal development Depending on the area of work, supervise the work of others. Co-ordinate the work of others to ensure modules are delivered to the standards required. 10 Teamwork, Pastoral Care Teamwork Appointments at this level may be required to: Act as a responsible team member, leading where agreed, and develop productive working relationships with other members of staff. Co-ordinate the work of colleagues to identify and respond to students’ needs. 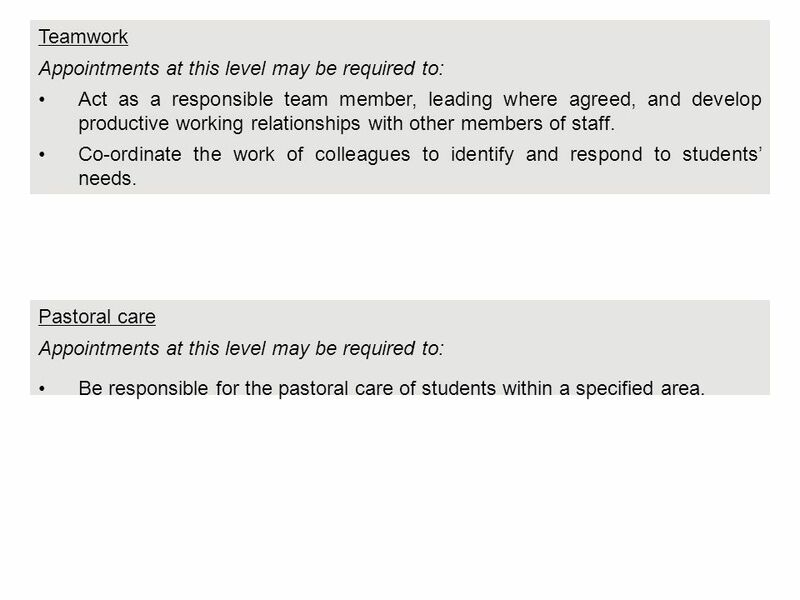 Pastoral care Appointments at this level may be required to: Be responsible for the pastoral care of students within a specified area. 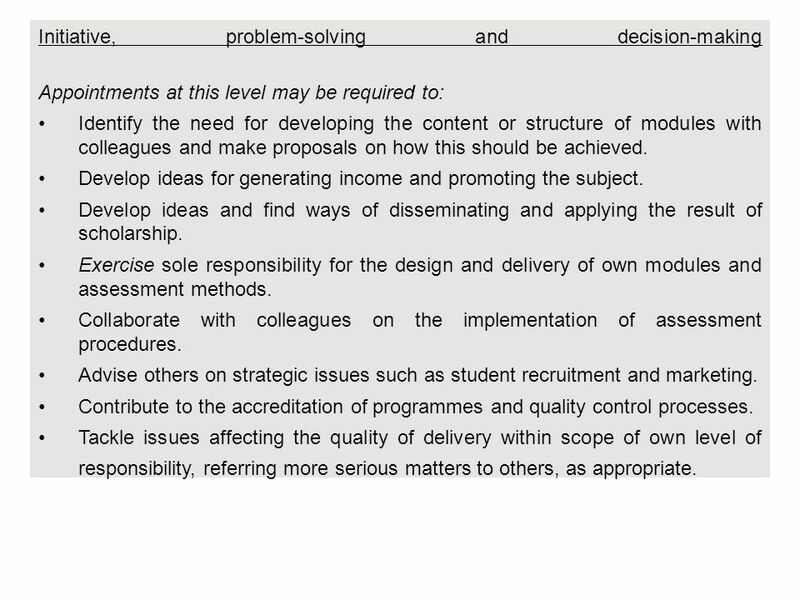 11 Initiative, problem-solving, decision-making Initiative, problem-solving and decision-making Appointments at this level may be required to: Identify the need for developing the content or structure of modules with colleagues and make proposals on how this should be achieved. Develop ideas for generating income and promoting the subject. Develop ideas and find ways of disseminating and applying the result of scholarship. Exercise sole responsibility for the design and delivery of own modules and assessment methods. Collaborate with colleagues on the implementation of assessment procedures. Advise others on strategic issues such as student recruitment and marketing. Contribute to the accreditation of programmes and quality control processes. Tackle issues affecting the quality of delivery within scope of own level of responsibility, referring more serious matters to others, as appropriate. 12 Planning & managing, Physical & emotional demands, Expertise Planning and managing resources Appointments at this level may be required to: As module leader or tutor, co-ordinate with others (such as support staff or academic colleagues) to ensure student needs and expectations are met. Manage projects relating to own area of work and the organisation of external activities such as placements and field trips. Be responsible for administrative duties in areas such as admissions, time- tabling, examinations, assessment of progress and student attendance. Sensory, physical and emotional demands Appointments at this level may be required to: Balance the pressures of teaching and administrative demands and competing deadlines. 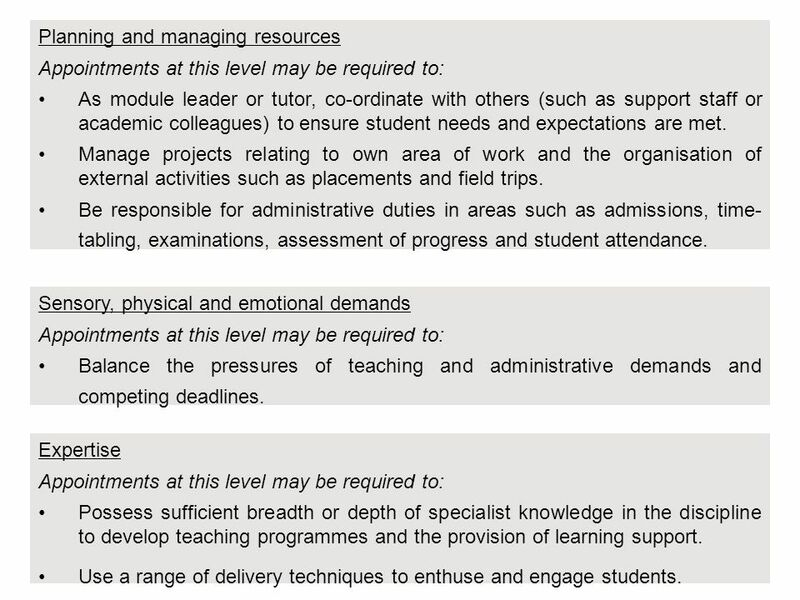 Expertise Appointments at this level may be required to: Possess sufficient breadth or depth of specialist knowledge in the discipline to develop teaching programmes and the provision of learning support. Use a range of delivery techniques to enthuse and engage students. 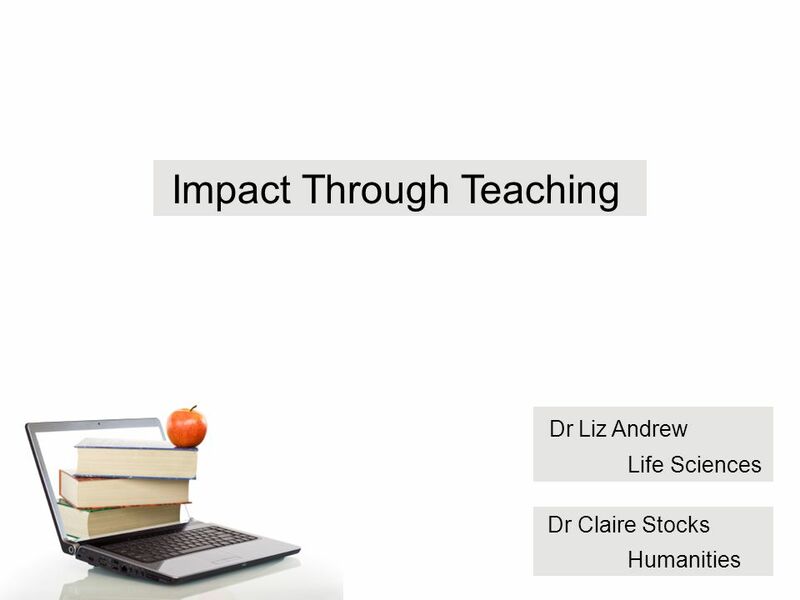 Download ppt "Introduction Impact Through Teaching Dr Liz Andrew Life Sciences Dr Claire Stocks Humanities." Stage One: Registrant Mentor, (N.M.C., 2006). 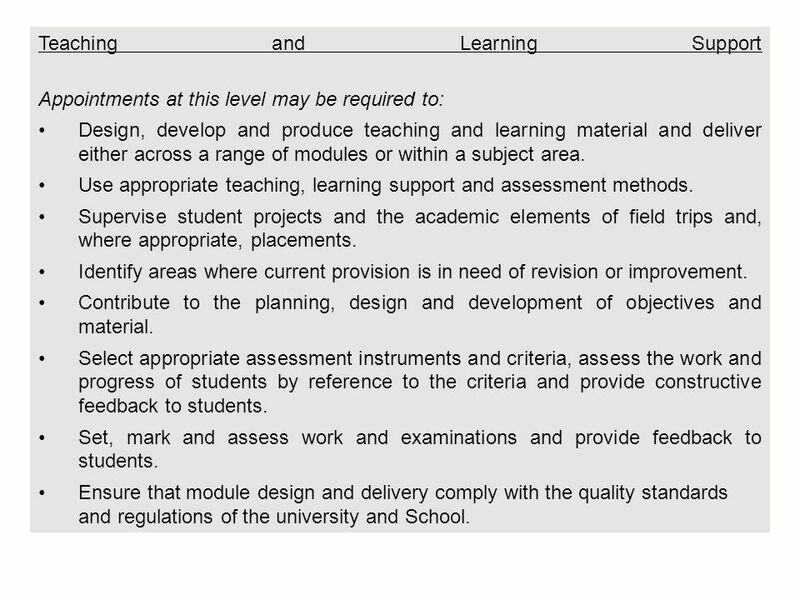 Assessment: Aligning Assessment to Learning Outcomes by Dr Charles Juwah Department for the Enhancement of Learning, Teaching and Assessment RGU: DELTA. HE in FE: The Higher Education Academy and its Subject Centres Ian Lindsay Academic Advisor HE in FE. Sheffield Hallam University CPD Scheme: "Realising our Potential"
UWE Bristol External Examiners day 29 th January 2014 Jenny Dye, UG Modular Scheme Leader, HLS Judith Ritchie, Director of PG Studies, FET. 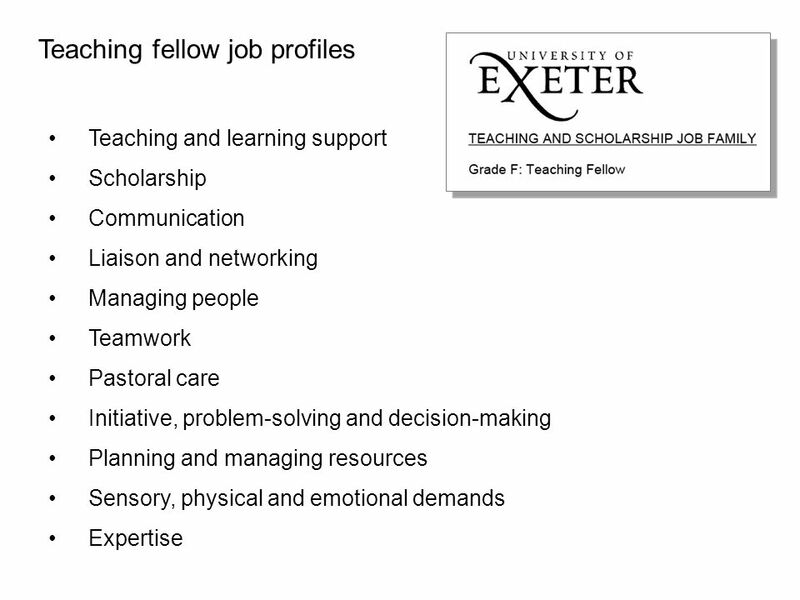 Dr Julie Hulme HEA Discipline Lead for Psychology Developing your academic teaching career. Stepping StonesStepping Stones Programme Stepping Stones Stepping Stones Programme Next Step The Requirements Sylvia Tevlin Human Resources Manager. 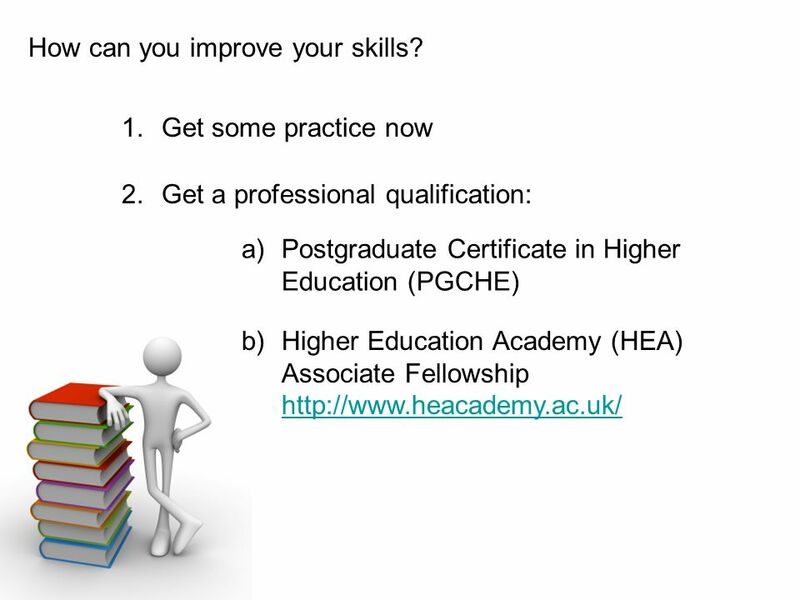 Careers In Academia – How to beat the competition! June Kay Careers Development Consultant. Quality Enhancement and Communications The development and delivery of a research active curriculum will be promoted as a core and high quality activity. Enhancing Academic Practice Nigeria Role of Newcastle University. Professional Recognition and engagement in continuing professional development: Why bother and what is in it for me? – Development.